There was a great weekend of results for BRDC Members this weekend with a victory for Dario Franchitti in the IRL and two podiums in the Le Mans Series. 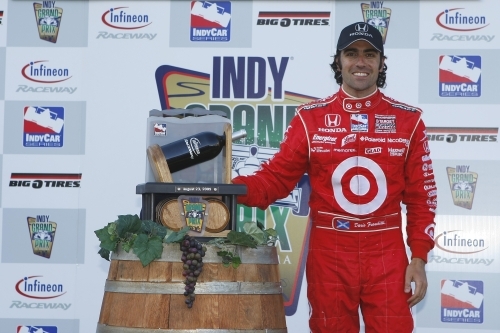 Dario Franchitti resisted constant pressure from fellow BRDC Full Member Ryan Briscoe in the Sonoma Indy Racing League race yesterday to claim his fourth win of the season and head up all BRDC podium. Both Dario and Ryan, who was second, managed to stay free from a first lap multi-car incident as Dario led from flag to flag. Mike Conway secured the final podium spot, despite becoming caught up in the first lap collision, to secure his first Indy Car podium. Darren Turner and Stuart Hall were part of the Aston Martin celebrations at the Nürburgring 1000km yesterday as the team secured a 1-2-3 finish. Darren, teaming up with Harold Primat in the 009 car, took second place having qualified in second and managed to stay in touch with the lead Aston Martin throughout his double stint. Stuart was in third with Chris Buncombe and Miguel Ramos in the 008 for his first podium in the Le Mans Series. Also out in Nürburgring with the Le Mans Series were Jonny Kane who was 12th overall and seventh in the LMP2 class and Rob Bell who was 22nd overall and ninth in the LMGT2s. Karun Chandhok was in Valencia at the weekend for the seventh weekend of the GP2 Series. The BRDC Full Member did not finish the first race but certainly made up for it with a sixth place finish in race two. Ben Clucas raced in the Zolder 24 hours in a Mosler this weekend for British team Top Cats Racing. Testing and qualifying went well with Ben able to take to the grid in tenth. Ben began the race and managed to get up to fourth but then unfortunately suffered a terminal problem with the car which spelt the end of their race after two and a half hours.